This simple shading exercise on Ingres paper was completed as a step by step Youtube clip. Each stage is clearly laid out within the speed art movie, but is explained in depth here. This drawing demo comprises a typical village scene, in this case, a church enclosed by trees. The church is located in the Lake District in the UK. The drawing equipment used for this sketch was pastel pencils in the following colors: white, light grey, mid grey, sepia and black. 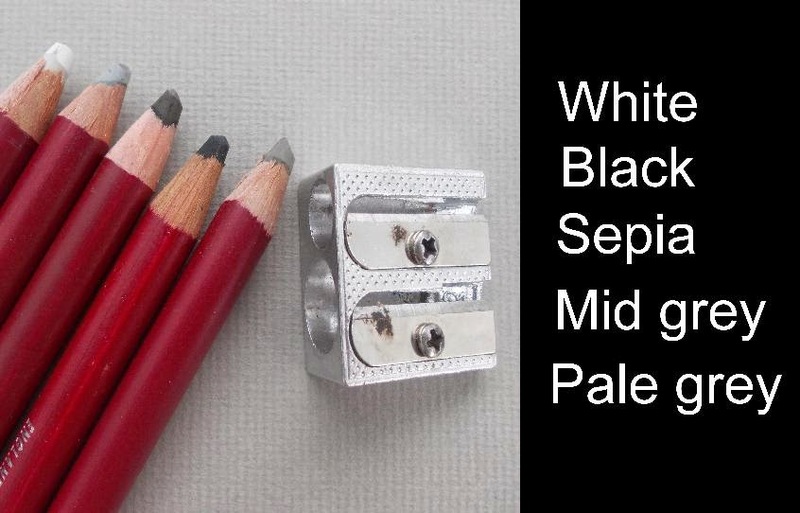 A wide pencil sharpener, HB pencil and eraser were used for the preliminary drawing. The Ingres paper used was A5 (8inx6.5in) in size. Briefly, Ingres paper is simply a toned paper with a canvas-like texture. I used mid grey paper in this exercise, where the texture was like canvas. Ingres paper can be found in an array of tones from duck egg to dark grey. The texture of Ingres paper means that soft pencil can ‘skid’ over the rough surface, leaving behind pleasing textured effects. After carefully completing the line sketch (use the eraser sparingly as it could flatten the texture of the paper) I shaded the sunlit rooftops with white. I applied firm pressure to create a relatively solid tone. The edge of the white pencil was used to bring out sharp detail around the spires and the sunlit walls. For the shaded walls, I lightly shaded sepia pencil to create a sharp contrast in tone, but softened the tone with mid grey afterwards. Working pencils in layers helps to bring an even, soft tone to the buildings. Always avoid exerting too much pressure initially. I used the soft edge of the pencil tip. 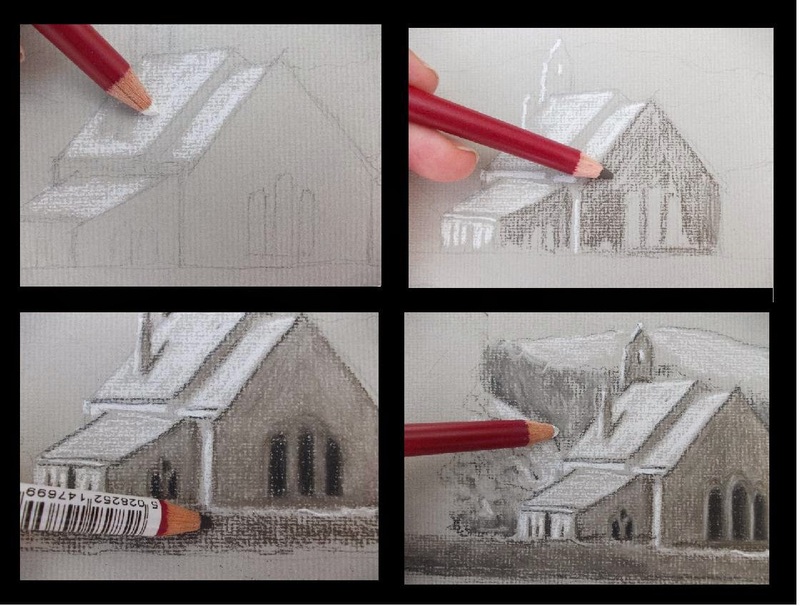 Once the mid grey was shaded over the church walls, I carefully illustrated the windows with black. Keep edges sharp for detail. This means using the sharpener for these areas. Take note that a little mid grey is needed where the light catches the architraves. This will help suggest recesses in the church wall. Once the church tones had been blocked in, I shaded mid grey on the drystone wall in front, dappling white at the top of the wall. This helped suggest sunlight catching the top of the wall. As can be seen, an array of textures was used for the background. I applied pointillism and irregular marks over the sunlit canopies behind the church, and then shaded a more even layer over the distant woodlands. I moved the pencil in vertical strokes to emulate the trees. White was used for the sunlit tops and the hills. Remember to keep comparing how one tone relates to another throughout the painting. This helps retain tonal imbalances. I applied an uneven layer of white over the sky and the foreground to bring harmony to the composition. I allowed some of the grey paper to show beneath in places to retain that textural feel. I finally scribbled sepia over the large tree on the left, moving the pencil in the direction of growth. I was careful not to overdo it, or the area could look overworked. I used a black pencil for the darkest areas. As a final touch, I drew the spires at the top of the roofs and neatened detail. Sharpened pastel pencils were needed for these areas. As can be seen here, an effective sketch in pastel pencils on Ingres paper can be completed within an hour and with just a few pencils. I began light first, working into darker shades later on the drawing. Applying shading lightly will bring out the texture of the paper.